It’s about damn time that Jason Mantzoukas made an appearance in an episode of NTSF. He co-hosts the How Did This Get Made? podcast with Paul Scheer and June Diane Raphael, writes for Childrens Hospital, gave a great guest performance as fragrance mogul Dennis Feinstein on Parks And Recreation, and functions as a more vulgar Jean-Ralphio as Rafi on The League. The guy is pure gold in nearly all of his onscreen appearances, so when he shows up in “Comic-Con-Flict” as the creator of Lucifurious, a comic property being adapted into a Broadway musical to the tune of a $25 million licensing agreement, I knew the episode was heading for some great material, even in the midst of one of the best episodes of the season. 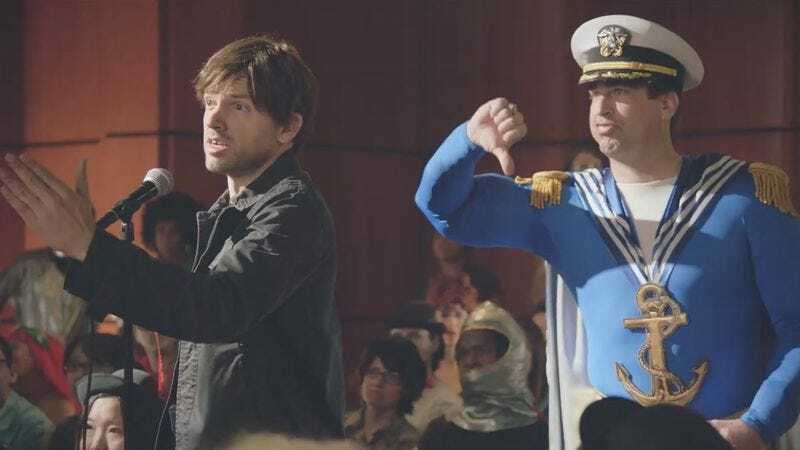 Before the team even hits the faux-convention floor, the episode kicks off with another high-profile guest star, Saturday Night Live’s Bill Hader, playing another comics creator who defiles his vigilante character by moving him from “Grimm City” to Coconut Grove to fight villains like Paparazzo, Club Kid, and LeBron James. Hader’s bitter ex-partner Crowley Moorehouse enters (looking more than a bit like he was inspired by Alan Moore), asks Hader if he’s ashamed of himself, which causes Hader’s head to explode without warning. Since Jessie is the only NTSF team member obsessed with comic books, she’s the only one who can communicate with Moorehouse in a made up language, deciphering that a group of comic-book purists known as Fan Boyz, who plant tiny bombs on people by sticking a pin in the back of their neck, are responsible for the death of Hader’s character. The group is preparing to strike at Comic-Con to take down another shameless creator ruining a beloved property, so the team rushes over and fights through the masses before finding Mantzoukas. The best scene in the episode, and one of the best scenes of a very strong season so far, is Trent’s feeble attempt to muster up questions in order to keep Mantzoukas’ head from exploding. Responses like “one can only assume that because it’s called French toast it was made in France,” and Trent’s terrible questions—“Shirts: for or against?”—tumble out in quick succession as Mantzoukas gets desperate for his life and Trent struggles to interact in a normal, non-NTSF setting. Making fun of comic-book culture can be dicey, especially if it’s one-sided, but NTSF takes aim at both overzealous fans and stuffy creators in a way that trumps up the whole community to a point where it looks ridiculous. The final move in the plot finds a way to skewer both the greedy creator with no integrity and the merciless, continuity-obsessed devotee: Piper brings a fanboy to relieve Trent at the microphone, locking him and Mantzoukas together in an endless Q&A loop for survival—and watching that back-and-forth doesn't get old. Someone get this guy his own show. Comic-Con is San Diego’s largest cultural event. Yes, they have the perpetually underachieving Chargers and Padres—as well as a fantastic zoo—but for media junkies Comic-Con is the be-all end-all of San Diego. It’s kind of surprising it took NTSF until its second season to use it as the setting for an episode. Tonight’s opening title card is the weakest of the season. Sure, I still laughed at it, but a fart joke is an easy laugh to get, and the rest of the title cards from this season have been much stronger. Trent keeps asking OCD Detective his opinion on gruesome crime scenes splattered with blood. It’s a great bit, especially since Paul Feig plays the detective. Piper hates the objectification of women in comic books… until she sees herself as a comic book character with giant breasts. Then everything is okay. When in doubt, Kove turns to the power of Gale’s intuition. Rob Riggle is back as the POTN, shilling his comic series and breaking Fan Boyz necks! Brandon Johnson showed up in this week’s episode of The New Normal as a waiter/actor whom Andrew Rannells hires mid-party to act as one of his black friends. Good for Johnson, but man it was weird to see Alphonse pop up on a Ryan Murphy show.